In order to appreciate how grave my headline is, it very important that I explain what a White Paper is. Wikipedia provides that “A white paper is an authoritative report or guide that informs readers concisely about a complex issue and presents the issuing body’s philosophy on the matter. It is meant to help readers understand an issue, solve a problem, or make a decision.” Jumia, that online platform from where you can buy a number of merchandise including electronics, mobile devices and clothes and shoes, has issued its second white paper that supposedly contain useful information concerning the African mobile trends. But, as you will shortly see, the 2016 Jumia White Paper contains grievous errors that erased the significance of the white paper. From this infographic alone, and assuming you had zero knowledge about mobile subscriptions, you will be happy to be informed that right now the mobile subscriptions globally are slightly more than 1.7 billion, and you may not care to countercheck through Google. 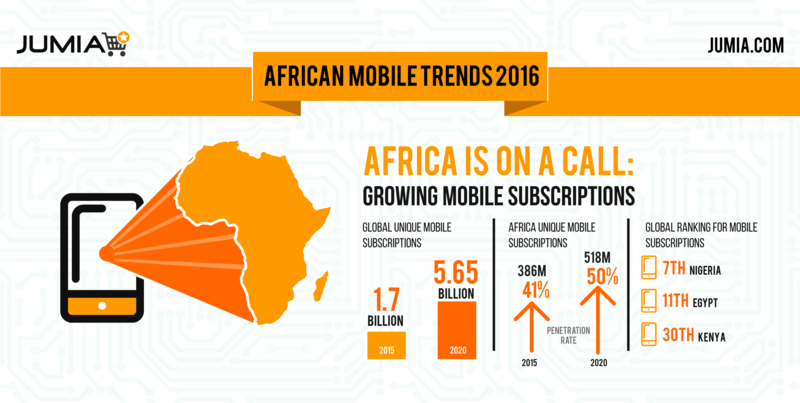 This figure of 1.7 billion is further reinforced by this sentence from the Jumia White Paper, and I quote, “The world has never been more connected than it is today: there were 1.7 billion unique mobile subscribers on a global scale at the end of 2015”. So far so good, until you read the subsequent sentences that tries to put the figure 1.7 billion in perspective. The sentence reads, “This means that almost 70% of the world’s population was communicating through a mobile phone in 2015”. As a person who is aware that the global population reached and surpassed the 7 billion mark back in 2011, you’ll realize that there is no way 1.7 billion can be 70% of 7 billion. Basic calculation should be able to reveal to you that 70% of 7 billion is 4.9 billion. Again, a white paper by someone like Jumia should recognise the fact that the global population is not statistic but has been growing in the last five years by around 79 million people per year. According to estimates, currently the global population should be somewhere around 7.4 billion people, which would imply that 70% of the population would be somewhere near 5.18 billion. The error by Jumia White Paper does not end there. The paper goes ahead to claim that the number of unique mobile subscriptions is expected to rise from the claimed 1.7 billion “to 5.645 billion by 2020”. That should be a rise caused by some 4.945 billion new unique subscriptions, right? Wrong. According to Jumia White Paper, “In just 5 years, almost three quarters of the entire world population will possess a mobile subscription, with almost 1 billion new subscribers added over this period.” The paper goes ahead to emphasise on the 1 billion figure by stating, “The developing world will fuel most of that growth, accounting for 90% of the 1 billion incremental subscribers expected between 2015 and 2020”. Up to this point, why should anyone who takes basic math seriously care to read the paper any further? Although the paper claims to provide us with data about the number of mobile subscriptions in Kenya (e.g. that some 3.6 million smartphones were sold in the Kenyan market in the year 2015), the discrepancies already encountered should alert you that the rest of the paper could equally be just as trash. I tried to check out whether there was a serious typo on one of the figures and discovered that probably Jumia meant to tell us that by the end of 2015, some 4.7 billion people had subscribed to mobile phone services worldwide. This could have been close to the figure given to us by GSMA Intelligence that tries to show mobile subscription data in real time. Right now, GSMA Intelligence estimates that there are some 4.757 billion unique mobile subscriptions, and counting. Okay then, it seems the 4.7 billion figure was mistyped as 1.7 billion, but how did Jumia arrive at the 70% figure? Out of a population of 7.4 billion, 4.7 billion should be 63.5%, way below the 70% even when rounding up is considered. Assuming that Jumia used the 7 billion figure, then the 4.7 billion figure should come to 67%, which is still way below 70% estimate by a significant 3% or 222 million subscriptions. The only way Jumia could have arrived at 70% is if they assumed that the global population is somewhere around 6.7 billion people. I am not sure if you still want to know the other stats given to us by that paper, but just for the sake of blogging I will summarise the stats in a new blog post.